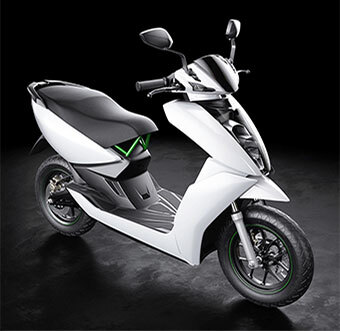 The Bangalore-based startup Ather Energy Pvt Ltd unveiled electric scooter S340 at tech summit Surge 2016 in the city on Tuesday. S340, which promises a top speed of 72 kmph, is powered by an IP67-rated Lithium battery pack and has a range of up to 60 kms in one charge. The startup was founded by IITians Tarun Mehta and Swapnil Jain in 2013 and has the backing of Tiger Global Management and Flipkart's co-founders Sachin Bansal and Binny Bansal. It had also got the backing of serial entrepreneur and CEO of Medall, Raju Venkatraman and Bay Area-based Srinivasan Venkatachary who is an executive at Google. S340 claims to have a lifecycle of 50,000 kms and a life span of five-six years. "The future will be connected and inevitably electric and Ather S340 has been built as a manifestation of this philosophy. Intelligent vehicles will revolutionise commute experience in the future and S340 stands at the cusp of this exciting reality," said Tarun Mehta, CEO and co-founder, Ather Energy. S340 takes 50 minutes to reach 80 per cent charge in the fast charging mode and it can be loaded from any 5A socket. The scooter sports a muscular look and LED lights that respond to ambient light conditions. The scooter has a touch screen dashboard that integrates cloud based data to help personalise the ride experience. Features like user profile based sign in, on-board navigation, pre-configured drive modes (sport and economy) add to the personalised experience. S340 is also linked to a mobile app that keeps the rider connected with the vehicle. It will help commuters configure ride, profile preferences and also sync navigation routes remotely. The company, which has a manufacturing unit in Bangalore, will start rolling out S340 by the end of this year. It is looking to build an online-only purchase model with doorstep delivery and service. Initially, pre-ordering of the scooter will be made available in Bangalore, Chennai and Pune. Last year, the firm raised over Rs 75 crore ($12 million) in a Series A round from Tiger Global Management. According to US-based market research agency Navigant Research, global annual sales of e-motorcycles are expected to grow from 1.2 million vehicles in 2015 to 1.5 million in 2024, while sales of e-scooters are expected to grow from 4.1 million to over 4.4 million in the same period. Hero Electric, part of the group which also makes Hero Cycles (separate from Hero MotoCorp), is one of the prominent players in the business. It had entered the market around a decade ago in a JV with UK-based e-vehicle tech firm Ultra Motors. It later scrapped its JV and bought Ultra out. Another player is YO Bykes, run by public listed firm Electrotherm. Similarly Mahindra Group that sells electric cars through Mahindra Reva Electric Vehicles also has a US-based venture GenZe that manufactures electric two wheelers and is separate from Mahindra Two Wheelers.